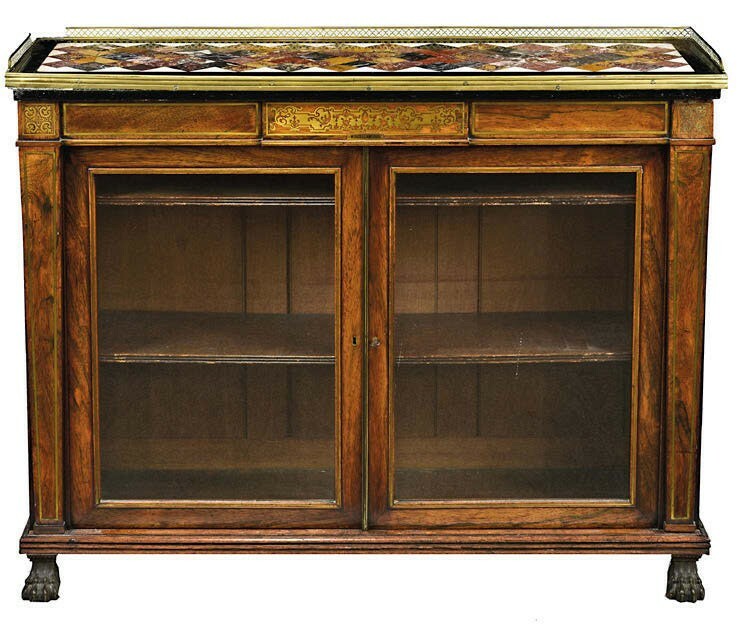 One of a pair of Regency dwarf bookcases sold for £58,000 by Martel Maides. They were bought by a UK dealer, one of eight phone bidders with another in the room, well above a £5000-7000 estimate on April 3. Although not as well known today as some of his contemporaries, the London ‘cabinet maker and upholder’ George Oakley (1773–1840) was a key figure in the Grecian revival – his high-qual ity wares promoted through a design catalogue featuring ‘a constant supply of every kind of fashionable Furniture’ and a showroom on Bond Street. The Morning Chronicle recorded in 1799 that “the royal family did Mr Oakley the honour of viewing his Printed Furniture Warehouse; when her Majesty, the Duke and Duchess of York, and the Princess &c., highly approved of the splendid variety which has justly attracted the notice of the fashionable world”. The pair of cabinets, from a deceased estate and requiring some attention to losses, had been in Guernsey since the mid-1960s. Estate paperwork suggested a connection with a house called Edgecliffe on Salcombe Hill, Devon. Each measuring 4ft (1.22m) wide, they are veneered in rosewood with typical brass inlaid decoration and brass lion paw feet. A particular draw was the (possibly later) tops made in specimen marble. One of the pair carried a brass plaque titled Fiction, the other Miscellaneous. The price was a Martel Maides record for a piece of furniture, more than doubling the previous high of £22,000 bid for a George I walnut cabinet on stand in November 2014. Auctioneer James Bridges is positive about the overall health of the market. “Although this was the obvious highlight of the furniture section, it was really pleasing to see a genuinely high sale rate for the furniture with commission bids on over half the lots,” he said. “We keep hearing whispers that things might just be turning around for the furniture market at the lower price levels, but perhaps for the first time we can actually see evidence of it.